Civil Administration enforces law at pirate waste disposal site used to burn trash. The supervision unit at the Civil Administration closed a pirate waste disposal site at which trash, including, used batteries were incinerated. Burning batteries is intended to separate the plastic and metal parts in order to make the metal re-usable to sell. In addition, the dual-purpose material can be manufactured for terrorist purposes. The administration said that "the fire constitutes a flagrant violation of the law and severe harm to the environment." 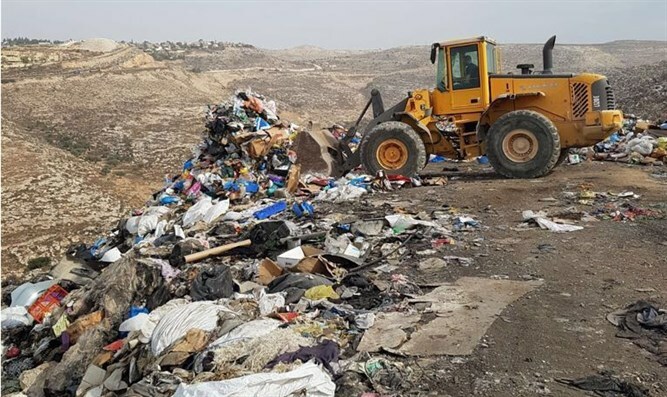 Meanwhile, a garbage truck was caught yesterday by a patrol of the Etzion Regional Council transporting iron and electronic waste from Israel to Judea and Samaria, with the aim of illegally burning the parts. In 2017, the Environment Unit of the Civil Administration seized some 210 trucks at various crossings that were carrying illegal waste and dual-purpose materials into Judea and Samaria. Marco Ben Shabat, director of the Civil Administration's monitoring unit, says that daily efforts are made to deal with hazards polluting the environment. "This is a flagrant violation of the law, and beyond that, causes severe harm to the environment. No one has the right to harm the natural environment that belongs to all of us and this is a common goal of all the bodies. We will continue to act to thwart and eradicate the phenomenon, in the hope that the entire population of the region will mobilize to put an end to crimes which harm the environment."